A dock owner in Devon has withdrawn the offer of a berth in its home port for the Falklands warship, HMS Plymouth. Associated British Ports said the decision was taken because plans for the redevelopment of Millbay Docks were happening faster than anticipated. The HMS Plymouth Preservation Trust wants to bring the ship to Plymouth as a visitor attraction for the 25th anniversary of the Falklands conflict. 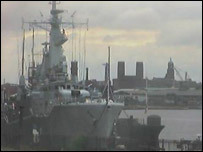 The ship is currently moored at Birkenhead on Merseyside. Built at Devonport Dockyard, HMS Plymouth was launched in July 1959. The Type 12 'Rothesay' class anti-submarine frigate played a major part in the Falklands War and was one of the few ships to be involved in every action of the campaign - surviving several direct hits from Argentine aircraft. The frigate was decommissioned in 1988 after almost 30 years in service and was visited by 88,000 people when put on display at Millbay Docks in 1989.